Teachers don’t usually toot their own horns, y’know? We do what we do because of the output, not the input. Still, though, it’s important for every teacher to check in from time to time and reevaluate what he or she gets from the job. It’s a good way to recenter yourself. The relationships I have cultivated with my students are absolutely the part of my career that I am most proud of. I am still in touch with many of the kids I’ve taught over the years, and I’m proud to say that many of them are successfully working or studying in college. I just discovered that a former student is majoring in chemical engineering. It’s safe to say that he is officially smarter than his former 4th grade teacher. Several of my former students are my Facebook friends, and while I know that some teachers are staunchly against “friending” their students, I truly feel like these kids are my friends. Many of them have come to me since leaving my classroom and asked for advice, or told me about the problems they’re facing. It is so important to me that I be there for them, whether they’re still in my classroom or not. *I just want to give a shout out to the best teacher I ever had, my 4th grade teacher!! my public school experience wasn’t the best but being in her class made it so much better. she was able to teach me better than anyone did. she would always know when something wasn’t okay and would comfort me. Mrs Dixon I love you bunches & appreciate everything you’ve done for me!! Everyday I try my best to connect with students. I see students that are hurting and I see students that love life . . . That’s what truly defines a teacher…a teacher connects, cares and is a champion for their students. How can you build relationships in your classroom? Take time getting to know your students. You don’t have to teach the rules and procedures on the first day. Spent that time meeting your kids and showing them that you care who they are. Show your students that you value their opinions. Allow them to make decisions about the way the room is decorated, about the way they present information, about what book to read for your next read-aloud. They have opinions – be open to them. Create a safe place for students to make mistakes. Teach them to learn from those mistakes. One morning last year, all teachers at my school got an email from our PTO president. 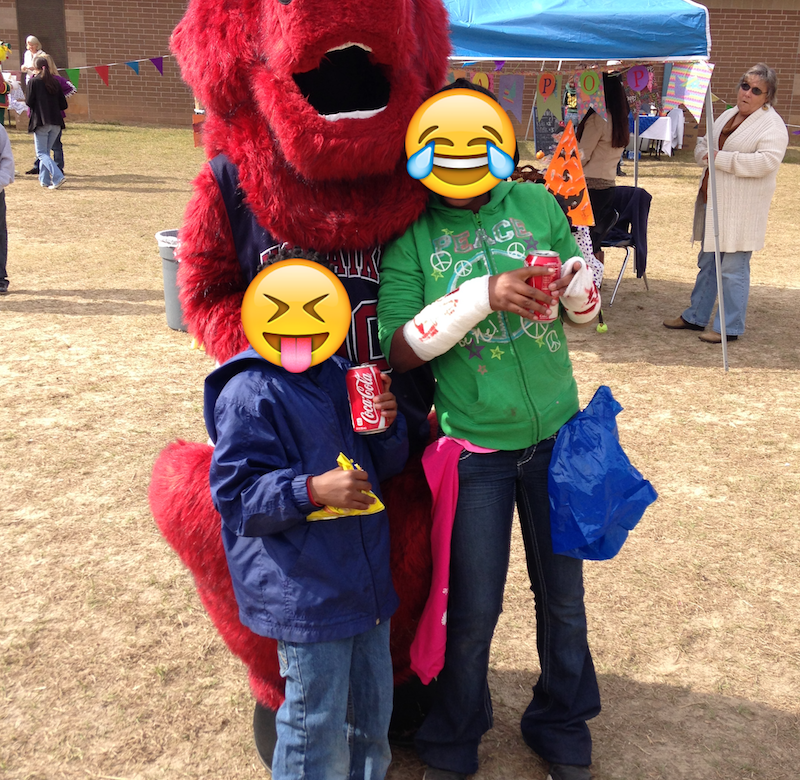 The PTO had decided to host a fall festival, and the date was set for a Saturday in October. The very next faculty meeting was grim. Teachers were upset. Sure, they had a reason to be. They give of themselves Monday through Friday, and their Saturdays are cherished. Especially Saturday mornings. Their fears were quickly assuaged, though, as they were told that they didn’t have to attend; the PTO would take care of everything. Let me repeat that: The PTO would take care of everything. What this translated to was that the parent volunteers would handle it. Some teachers seem to have forgotten that the PTO, PTA, whatever your school calls it… it’s a team, and teachers are part of that team. I didn’t enjoy getting up at 5:30 that Saturday morning, and I didn’t enjoy arriving at the school at 6:15 to set up. But what I did enjoy were the smiles on the faces of the kids who had never attended any kind of fair or festival before. I can spare one Saturday morning if it means helping my students make memories. Teachers make sacrifices, and those sacrifices don’t always end at 2:30. Those sacrifices aren’t always enjoyable. But they’re always worth it. Being a teacher means being a professional. It means serving on committees, sitting in meetings, and yes, attending events on Saturdays. It also means getting to do the best job in the world. I know, I know. You’re already busy. You’re a teacher – I get it. But you don’t have to do much in order to do a lot. In my first year of teaching, I stumbled across an opportunity to become a volunteer for ACIRA, the Aiken Council of the International Reading Association. At first, my involvement consisted of asking teachers at my school to join. It was easy. The teacher who’d done it before me was kind of a least-effort-possible kinda gal, so it was pretty easy to fill her shoes. But soon, I wanted to do more. I liked this group of adults who cared. They wanted to make things better for teachers and students, and I began to see what great opportunities this afforded. I also noticed that the organization was in danger of failing. Our meetings averaged 6-8 teachers, not counting officers who were required to attend. I started volunteering more, and eventually became ACIRA secretary. I even got my husband on board. Over the next several years, I served as secretary, treasurer, membership director, and president. I am proud to stay that while my husband and I were parterning together to run ACIRA, membership and meeting attendance increased drastically, and I believe that we really did make a difference. Full disclosure – I am not one of those teachers who has a great handle on separation of school and home! I don’t have children, and teaching truly is my hobby, so I enjoy spending way more than 40 hours a week dedicating myself to my craft. But you can do it too, without losing all of your free time. Drop off some books at a local shelter. As a teacher, you probably have books that have seen better days. Kids in a homeless shelter would be thrilled to get their hands on your old books. If you want to hang around and read to those kids while you’re there, you’ll feel like a rockstar afterwards. I guarantee it. ACIRA did this at Helping Hands a few times, and it was one of the most significant things we’ve ever done. Most of these organizations have local branches as well, which will allow you to network with colleagues and have a more significant impact in your community. These three accomplishments may not mean much to anyone else, but for me, they’re the most significant ones, and they’re the ones that make me love my job the most. I’m curious to hear about your accomplishments, too. Leave a comment and tell me what you’re proud of!